White dwarfs are the final phase of the life of small and medium mass stars and this means that it’s the Sun’s final fate too. Christopher Manser, lead author of this research, stated that the white dwarf SDSS J122859.93+104032.9 has a mass that’s about 70% of the Sun’s while the progenitor star had a mass more or less twice the Sun’s. Planetesimals are generally the building blocks that by accretion end up forming planets but in this case it seems that it’s a fragment of a planet that probably was torn to pieces during the agony of its star, which before becoming a white dwarf passed through the red giant phase. Approximately 410 light years from Earth, the white dwarf SDSS J122859.93+104032.9 is surrounded by a disk of debris formed by the remains of larger objects. Probably millions of years ago that was a star system with rocky planets that were torn to pieces when the star expanded and it’s no coincidence that spectral analysis shows among the various emission lines the signatures of elements such as iron, magnesium, silicon and oxygen, the most common also on Earth and in general on rocky planets. The analysis of the emission lines is exactly what led the researchers to notice anomalies that were interpreted as a planetesimal that leaves a trail of gas. It’s the first time that a celestial body that orbits a white dwarf is detected using this technique. The biggest surprise, however, came from the estimate of that celestial body’s orbit since its year lasts only two hours and this means that it’s very close to the white dwarf. Only a very dense object can be in such an orbit without being destroyed by the powerful gravity of the white dwarf, which is small but very dense, so the most likely hypothesis is that it’s composed of iron or iron and nickel. That type of composition suggests that it’s a rocky planet’s core or part of its core. The estimated size of the planet is still very raw since it ranges from a minimum of one kilometer to a few hundred kilometers in diameter. In essence, it could be an asteroid left over from the destruction of a planet or a dwarf planet that used to be the core of a super-Earth whose lighter outer layers were stripped by the star’s gravity during the red giant phase. 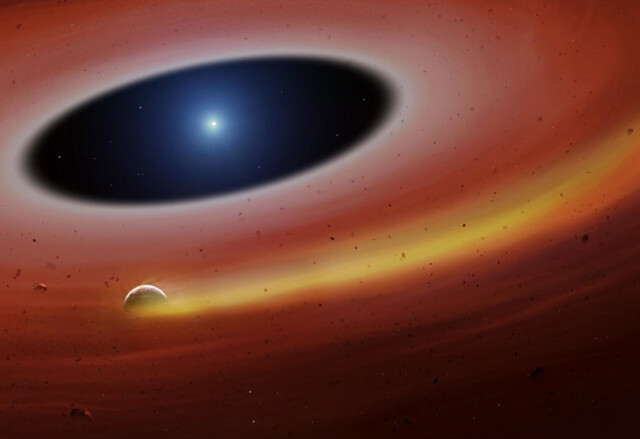 This planetesimal has a sort of gas tail similar to that of a comet that creates a ring inside the disk of debris, the one that allowed it to be identified. It’s a situation that could happen in the solar system in a few billion years, when a piece of the Earth’s core could survive the Sun’s death. This research is interesting because it offers new details on what can exist in a star system after its star turned into a white dwarf but above all because it offers a new possibility to explore systems of that type. Discovering the remains of destroyed planets can help learn more about those systems also offering possible clues about more distant and perhaps still intact planets.